When Can You Sue for Parking Lot Injuries? Parking lots can be full of hazards, such as potholes, shopping carts, vehicles backing out, and debris. If you were injured in a parking lot, whether due to a slip-and-fall or criminal activity, you may be wondering if you can sue the business for damages. At The Pendas Law Firm, we will review the circumstances surrounding your accident and help you determine whether or not you have a premises liability case. If you do, we will help you gather the necessary evidence to support your claim and ensure that you recover the compensation you deserve after sustaining a parking lot injury. Slip-and-Fall: Under premises liability law, property owners have a duty to their patrons to maintain safe and hazard-free grounds. For store owners, this responsibility extends to their parking lots. If you were to slip and fall in a store parking lot because of a huge pothole, ice (though unlikely in Florida), a runaway cart, or some other factor that the store owner has control over, you can file a claim for medical expenses, lost work time, and possibly more depending on the extent of your damages. 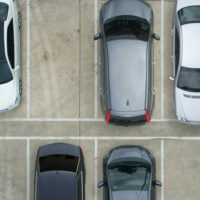 Car Collision: While, for the most part, parking lot car accidents are treated as they would be on the open road (one or both drivers are held liable), a parking lot owner may be held liable if the accident was caused because of a hazard in the lot. For instance, if a pothole caused your car to veer into another, or if an overgrown bush created a blind turn that resulted in your car running into another when you made the turn, the parking lot owner may have to pay up. Depending on the exact hazard, how long it existed, and whether or not they received complaints of said hazard before the accident, the owner of the store could be responsible for damages to both vehicles, and liable for the medical expenses of any injured parties. Crime: If you are robbed or assaulted in a parking lot, the storeowner could be held liable as well. However, in order to have a negligent security claim in Florida, you must be able to establish “foreseeability,” which means “A landowner has a duty to exercise reasonable care to protect against reasonably foreseeable criminal conduct”. While Florida business owners can protect themselves from a negligent security claim by implementing certain measures, a victim has the opportunity to sue if those measures were not met or if they were overlooked. An accident can have serious consequences on your life. From extensive medical bills to lost wages, you stand a lot to lose from a parking lot injury. The personal injury lawyers at The Pendas Law Firm understand what is at stake, and want to help you recover the compensation you need to pay for your damages. If you were involved in a parking lot injury, reach out to the personal injury lawyers at our Fort Lauderdale law firm to discuss the details of your case. Call 1-888-LPENDAS, or go online, to schedule a private consultation today. The Pendas Law Firm also serves clients in the Tampa, Miami, Orlando, Fort Myers, West Palm Beach, Daytona, Bradenton, and Jacksonville areas.